A new C64 game is coming and unlike any other game before it, you've got to climb and climb and avoid being crushed to death by falling rubble. Welcome to Tower of Rubble 64, a C64 conversion of a CGA entry by Flatgub, whereby the only challenge is to survive as long as possible on the lethal Tower of Rubble as it crumbles and rebuilts itself around you. Can you survive for a great high score, or will you end up getting squashed flat? 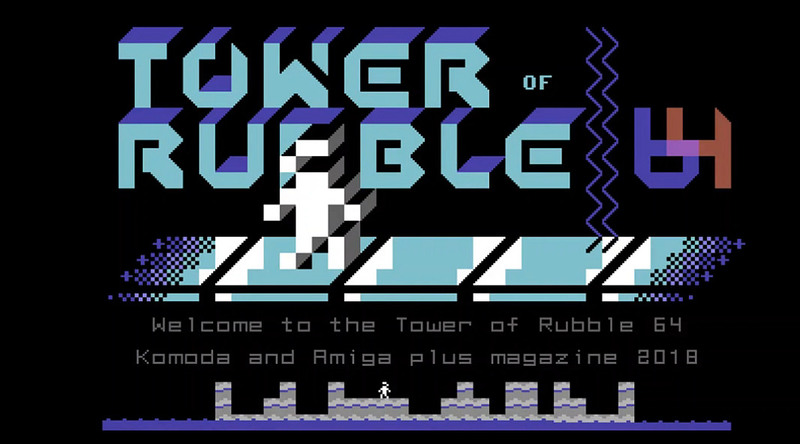 Tower of Rubble was originally a PC game developed for the CGA Jam. But now thanks to a team of people such as Tomasz Ankudowicz, Worrior1 and Gaetano Chiummo this crazy yet challenging game will be coming to a C64 near you very soon.